With our extreme temperature swings, our late, cold Spring is but a fleeting glimpse into the rear view mirror. Here is an established section of garden where we have been working on new additions to a very sustainable client’s garden. it’s been quite the Climate Change Spring. After the coldest April in 137 years, our intermittent warm spells have been in the 90s Fahrenheit. We can go a week or two without rain & then get unrelenting downpours. The plants have had interesting responses. Logistics have been challenging, but some beautiful gardens have resulted. 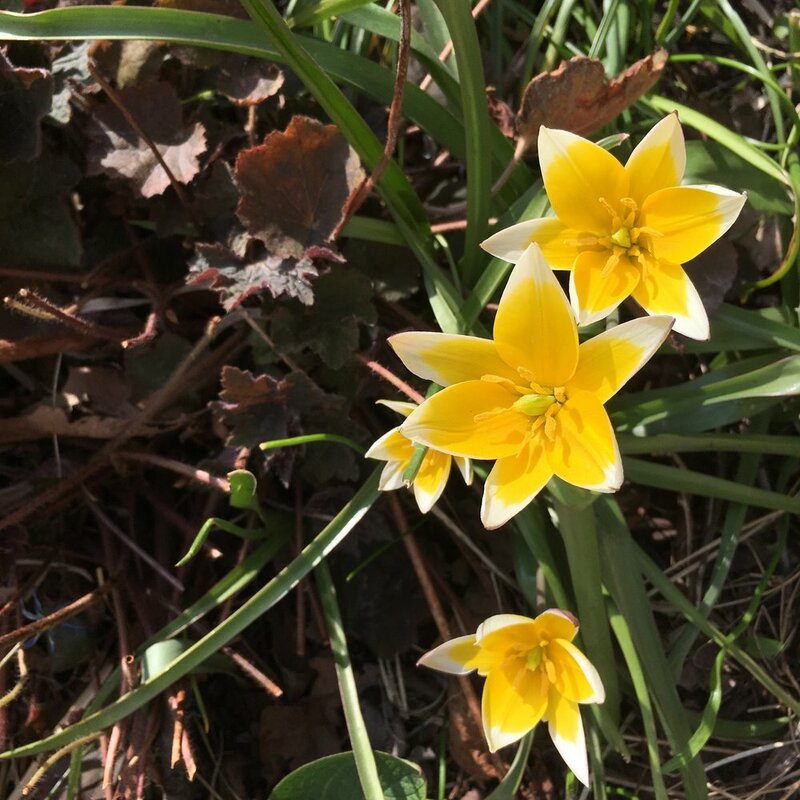 Well, the unseasonably cold weather (until the unseasonably warm weather three days ago) did have a plus: the early bulbs lasted a long time. Tulipa turkestanica. Species tulips are wonderful because they bloom early (when we are desperate) and last for years. Their foliage dies back fast. This one has lovely blue foliage enhanced by the contrast of bloom color. And I love the blooms, open or closed. Early signs. Crocus & Virginia Bluebells. Our early blooming Witchhazels are so cheery & welcome! The snow & light leading to Spring. But grateful for the contrast and plant blanket. The late afternoon light starting to be golden on Lake Michigan. One can be grateful for snow cover during these periods of extreme cold. It's that part of Spring when purples & pinks are on parade! Catkins on Ostrya virginiana. One of our fine upland (dry), shade trees.